Ski holidays Vosges Jura : compare ! 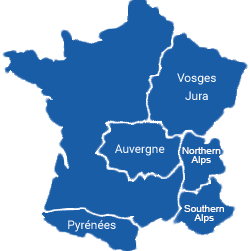 What are you looking for in the region Vosges Jura ? The Vosges and the Jura make up some of the most beautiful cross-country skiing locations and offer ski resorts suitable for the whole family. Magnificent panoramas and an incredible sense of freedom await you skiing in the Vosges and the Jura, which provide cosy and modern resorts. You can expect breathtaking landscapes, hiking, alpine skiing or even paragliding during your stay in the Vosges and the Jura! Enjoy an affordable renal in the Vosges or the Jura thanks to the thousands of ski comparison offers that you can find on the Ski Express website, provided by over 50 partner sites who are professionals within the sector. The prices that we post include booking fees and are ordered from lowest to highest price, for a more transparent comparison sevice. Chalets, apartment rentals,tourism residences, you’ll be spoilt for choice for your search for an affordable rental that meets your needs thanks to the criteria search provided by Ski Express. On top of this, if you’re going on a family ski holiday, you’ll be able to stayin à holiday park rental. A week in a holiday club is perfect for a lively ski trip with children, as you’ll be able to find on-site entertainment or children’s clubs for the school holidays. Escape to the1000km ski pistes of Jura at the lowest cost or to the family resorts of the Vosgian Massif, for a nordic family ski holiday. The areas of the Vosges and of Jura are destinations wherethe rental prices are generally the most affordable of the season according to our price barometre, also, you’ll be happy to benefit from the great value for money offered by our partners.